Last week, my employer, Bostik, Inc., had it’s annual UPAF (United Performing Arts Fund) donation campaign. I decided to be a member of the campaign committee for Bostik, though I can’t say that I felt I really pulled my weight (all day meetings and such distracted me). I did, however, become a member of the UPAF Next Generation affinity group – and was asked to be on the council of Next Generation (you’ll see my name in the list!). Not only am I happy to support the arts here in Milwaukee (so much in the way of great arts! ), but as a member of the NG council and contributing member above the threshold amount, I will be able to take advantage of great local networking events. I’m super excited to become even more connected to my current city! Note: I also won the dessert category of the pot-luck fundraiser using the family recipe mentioned here. I had missed serving my community. While living in Ohio, I had served on the board of my local Habitat for Humanity affiliate. I continued to work with HFH when I lived in Orange County, CA (though I couldn’t afford the $50K donation being a board member required). My work life in Detroit affected me so negatively that I didn’t take advantage of any of the numerous opportunities to volunteer and be engaged that the wonderful city had to offer (save for a Kickstarter campaign or two), because there is no shortage of opportunities to be involved in Detroit’s community activity. It’s nice to be involved again! On Monday of last week, I won two tickets to the opera. “Julius Caesar” is running March 28-30 at the Uihlein stage at the Marcus Center (a mere 0.5 miles from my place). So, my cultured friend Phi accepted my invitation to attend opening night. We decided to grab a bite at Kil@wat in the Intercontinental Hotel (which is a stunning space, in my opinion) prior to attending the opera. Conveniently, Kil@wat is just across the street from the theater. They are one of four properties associated with the Marcus, and offer rewards and discounts (darn it – I hadn’t received my Smart Card yet!). After a quick walk over to Kil@wat, Phi and I were warmly greeted, taken to our table, and advised that Jake would be our server. We had a drink menu, a full dinner menu, and a “pre-theater menu” presented to us. The theater menu (not up-to-date online) consisted of a few options for appetizer/soup/salad, entrée, and dessert for $30. Phi and I both opted to go that route, both because there were great options, and because she knew (from experience) that Kil@wat was swift in serving those items. So, I advised Jake that I wasn’t interested in the soup, but would empower him to choose everything else for me. He was all-in from the start. 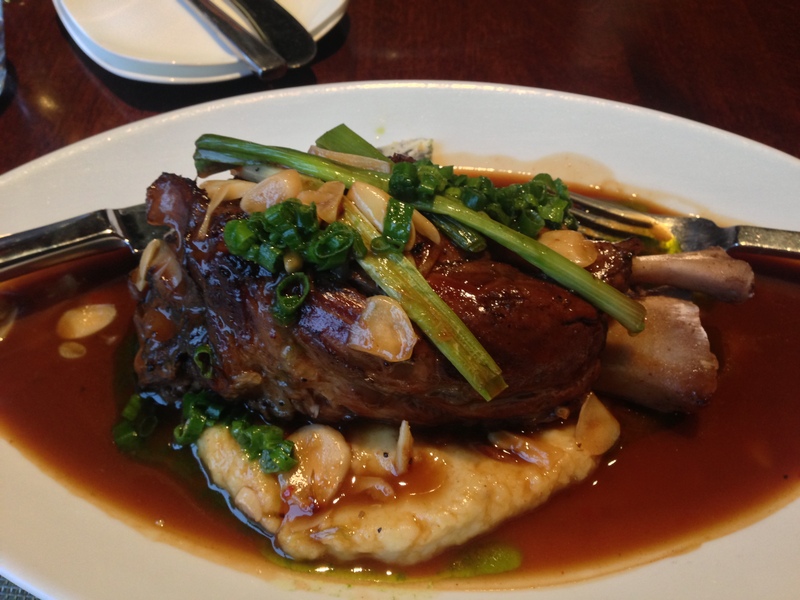 Braised pork shank with Yukon whipped potato, braised scallion, roasted garlic jus. Aside from that moment in which I bit into a thick slice of garlic and feared that Phi would not want to speak with me for the rest of the evening, this dish was perfection! I had initially questioned whether I needed a steak knife (stupid me), until I touched my fork to the pork and it just fell apart on my plate. 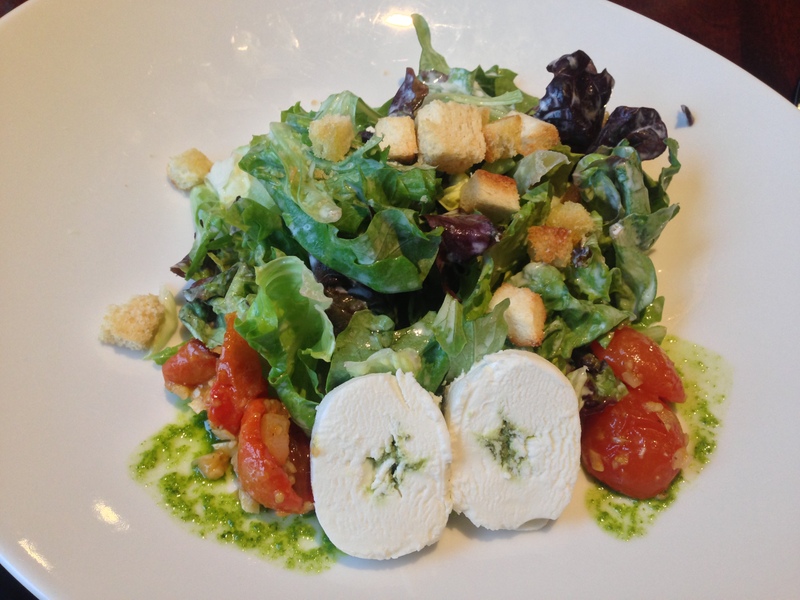 It was exceptional, and the garlic jus complemented it perfectly! I’m not ashamed to say that I finished just about every bite of this meal. And…still had an appetite for the dessert Jake chose for me! He chose the Chocolate3 (chocolate cubed). Phi had also chosen this dessert. 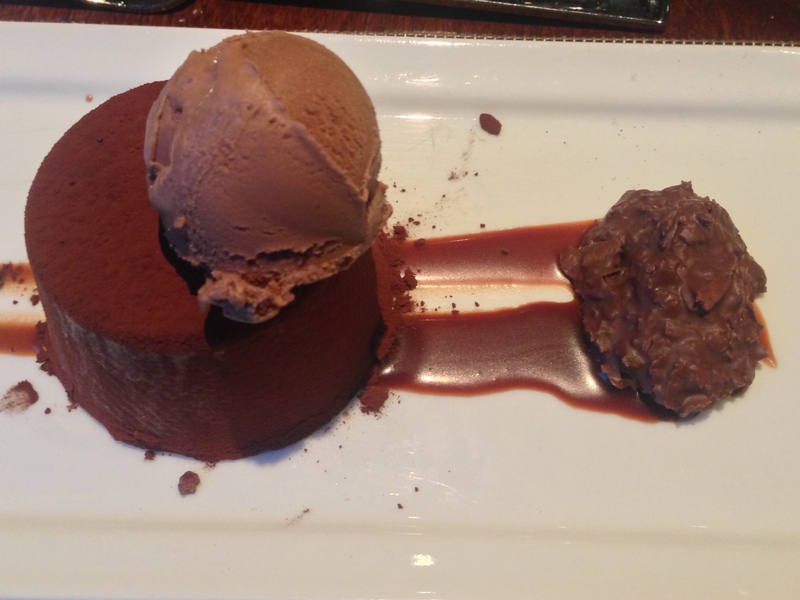 This decadent dessert consisted of dark chocolate mousse, chocolate ice cream, and chocolate caramel ganache. The panna cotta of the evening was mango, and I would have been perfectly happy with that dish, but this chocolate 3-ways was fantastic. Chocolate and caramel were made for each other! Jake and the rest of the staff at Kil@wat did a great job of serving up exceptional food and doing it in such that Phi and I were able to make it over to the theater right on time! Unfortunately, while we both felt that “Julius Caesar” offered up extraordinary music, the set and the actual stage performance were a bit lackluster. It just started off slowly and never really seemed to gain the momentum that we both needed on a Friday evening after a long week of work. It was definitely nice to get out and enjoy more of what Milwaukee has to offer, and I’m looking forward to future opportunities to do so. There are so many wonderful shows and performances coming to the city. Which are your must-see recommendations?